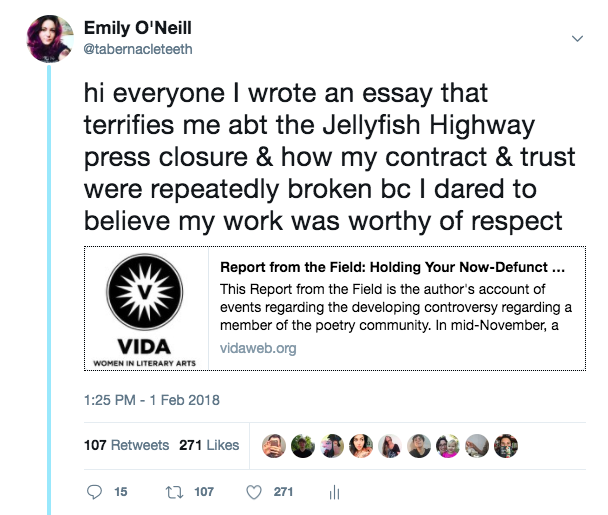 A few months ago a chapbook of mine went out of print, as well as the entire catalog at Jellyfish Highway, when the publisher refused to be held accountable for shady financial practices and sexist behavior in the academic and literary communities. The situation is on-going, and unfortunately is still far from a resolution. I was lucky enough to be given a platform to talk about my corner of the experience by VIDA's Report From the Field series. You can read my essay on the ways small publishing doesn't protect authors from worst case scenarios here. I'd like to thank my editor at VIDA, Emily Brandt, for all the help and encouragement I received as I drafted this piece. It was incredibly difficult to write, and I couldn't have done it without such thoughtful assistance. I also want to thank everyone who's reached out via Twitter, Facebook, and the contact form on my website with kind words, as well as their own stories of unresolved publisher abuses. Contracts only protect us if we're able to enforce their terms. When enforcement is cost-prohibitive or otherwise impossible, our only recourse is to tell our stories publicly. The more we make space to talk about these kinds of things, the better off we'll be as a community.